Saturday morning I was crossing the Steel Bridge on the Max when I saw a plume of steam rising from beside the river. I traced it along Water Front Park to the area where the stern-wheeler Portland is moored. In the distance I could make out the whirl of its paddle wheel. The Portland was under steam. It is a rare occurrence. I would not want to miss it. 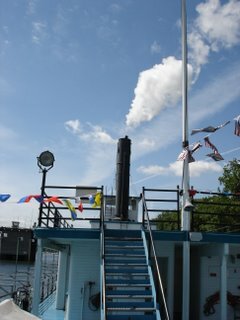 I was on my way downtown to do research at the Oregon Historical Society when I saw the plume. Minutes later I was on the deck of the Portland looking across its bow up river. Instead of researching history I had been shanghaied by it. The Portland was lauched in 1947, late in the twilight of the steamboat era on the Willamette & Columbia rivers. 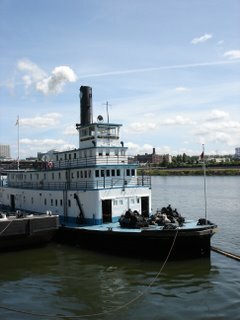 It was built for the Port of Portland to replace an earlier (1919) towboat of the same name. Original plans were for a modern screw-driven diesel but the harbor pilots preferred an older steam-powered stern wheel design for the shallow swift moving conditions of Portland’s harbor. 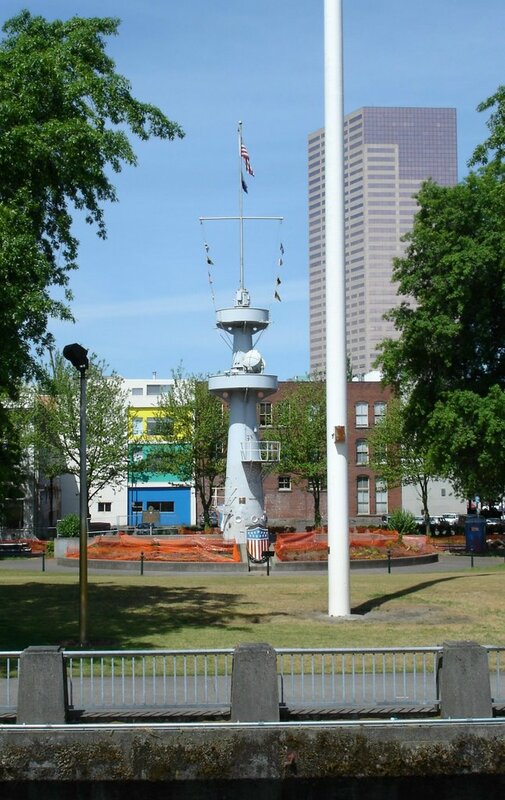 The Portland was built by Northwest Marine Iron Works using Gunderson’s side-launching ways in the Northwest industrial area. It is 219 feet long and has a beam of 42 feet. 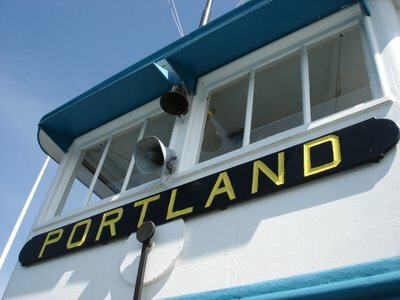 The Portland was retired in 1981 after a career of 34 years assisting ships through Portland's harbor. I hoped that the Portland was about to depart for a rare trip on the river but that was not the case. Still, it was great to hear the sound of its whistle. For the connoiseur, it is somewhat higher pitched and less throaty, but no less impressive than those of Portland's two large steam locomotives, the #700 and #4449. 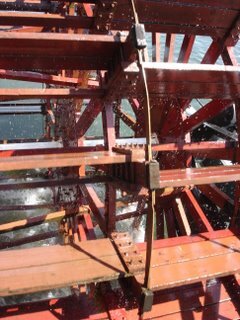 It was also interesting to watch the slow spin of its paddle wheel. 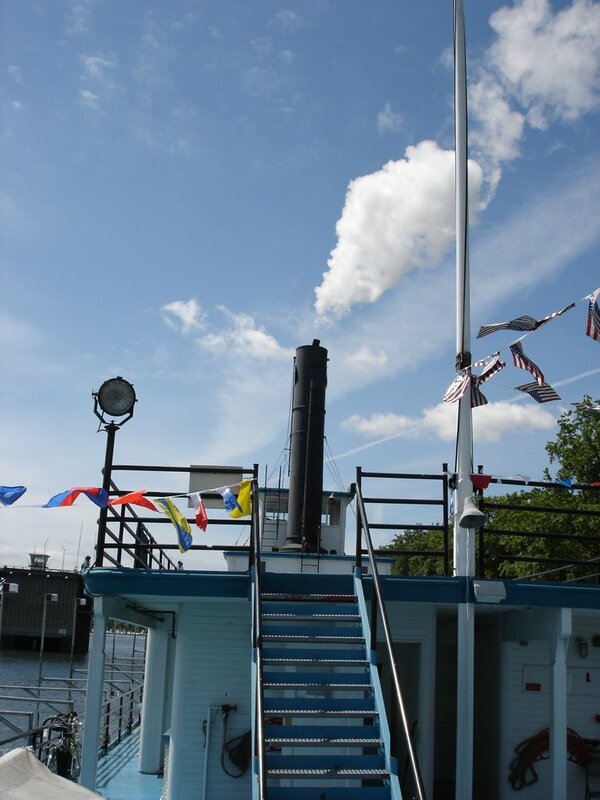 Like their steam-powered cousins on land, a stern-wheeler is best observed in motion. 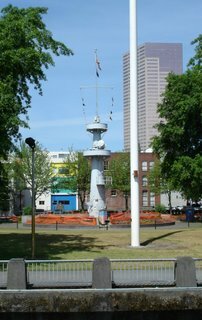 The Portland is the location of the Oregon Maritime Museum. It is open Friday through Sunday from 11 to 4. 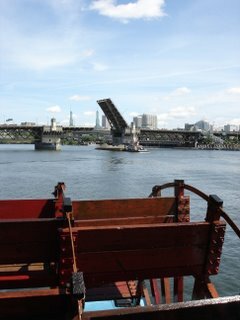 The Burnside Bridge lifts for a modern towboat pushing a barge load of gravel. The Oregon from the Portland. 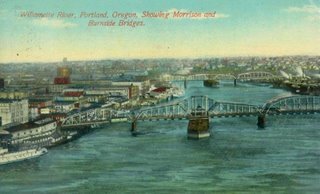 This pre-1925 view of the Willamette River through Portland shows the original Morrison (replaced in the mid 1950s) and Burnside (replaced in 1926) bridges. The location of the present day Morrison Bridge is slightly to the south of the original, near the steamboat on the left. 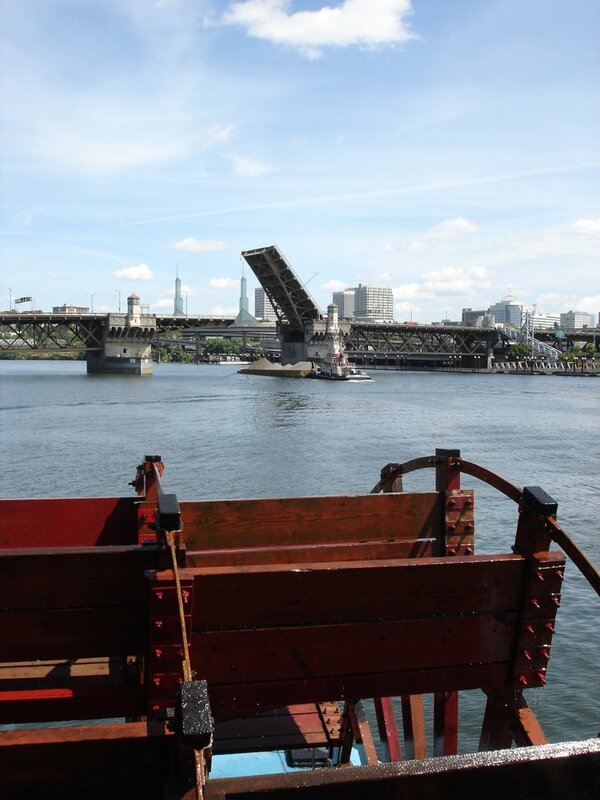 The Portland is presently docked near the foot of the original Morrison Bridge. 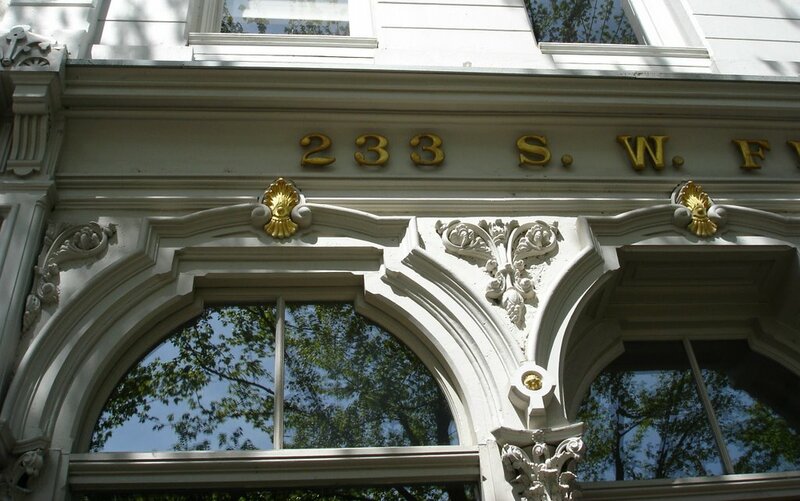 After leaving the Portland I walked over to #233 S.W. 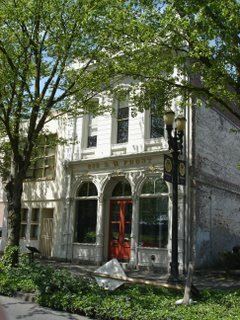 Front (Naito Parkway), one of the last cast iron facade buildings that border Front. 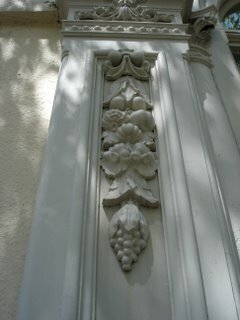 It was built in 1870 (original address #71 Front Street). According to "A Century of Portland Architecture" by Thomas Vaughan and George A. McMath, it was used by a druggist and an accountant in 1871. 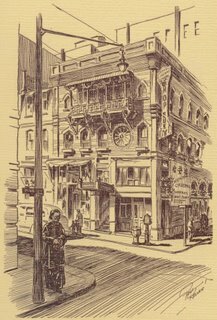 In 1879 it was the location of Neustadter & Son's Gentleman's Furnishings. Ten years later it was a warehouse owned by Isam White, a decline that reflects the gradual movement of retail inland during the later years of the nineteenth century. 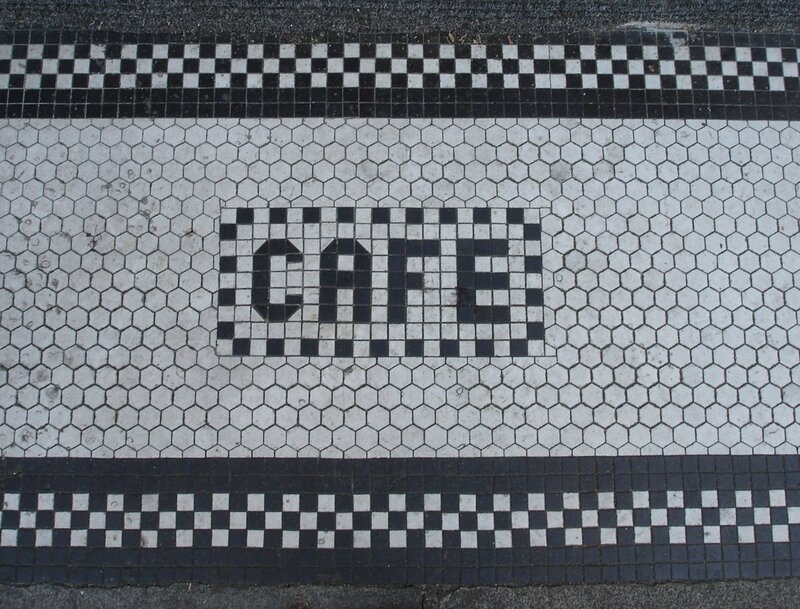 The building has lived a charmed life. It is amazing it is still here. The great fire of 1873 burned to within two blocks of it. 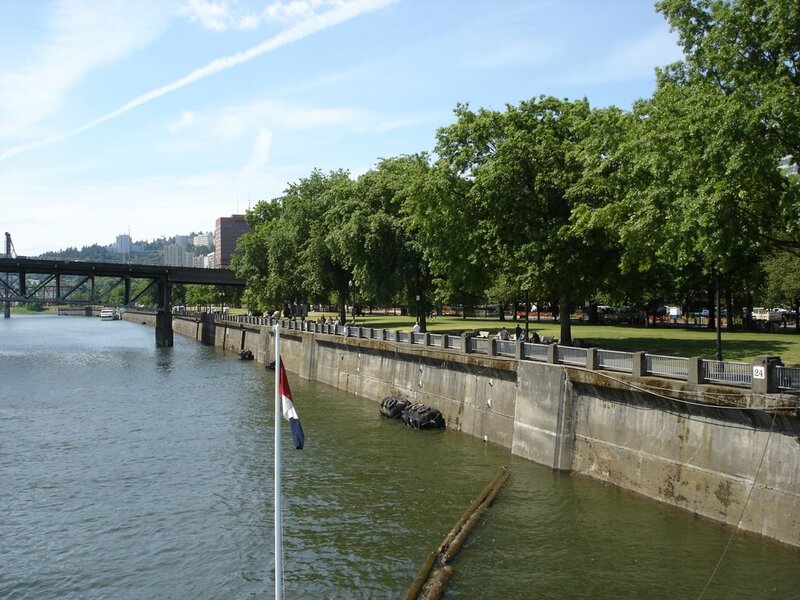 The seawall along the river, built in 1928 took down some of buildings that faced it across Front Avenue. The building of Harbor Drive freeway in 1950 took out the rest. The vogue for parking lots in the 1950's and the building of approach ramps for the Morrison Bridge decimated much of what was left of the old cast iron district. The stately little Italianate style building now faces Waterfront Park. It contains offices. 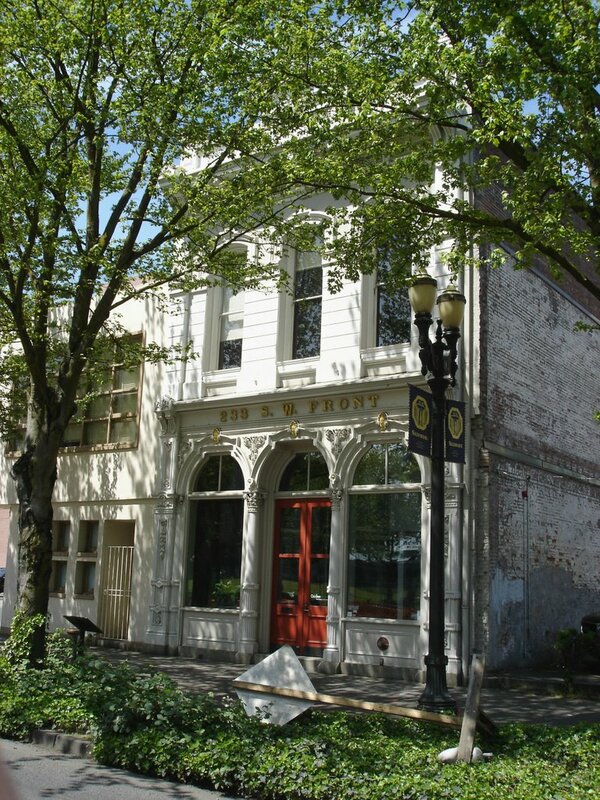 The Willamette Iron Works was located on North Front Street between D Street (Davis) and F (Flanders). It was a successeful manufacturer of castings from 1868 to the end of the cast iron era in the 1880's "Buiding Fronts and Castings of Every Description...(the) Largest Stock of Patterns North of San Francisco." As the Willamette Iron & Steel Works the company went on to manufacture steam "donkeys," a stationary boiler attatched to a grip wheel and cables for logging operations. In the 1920s the company manufatured the "Willamette" a Shay type geared steam locomotives for logging and mining use. The final stop on my impromtu history tour was a restaurant that I had been wanting to visit for awhile, the Golden Dragon. 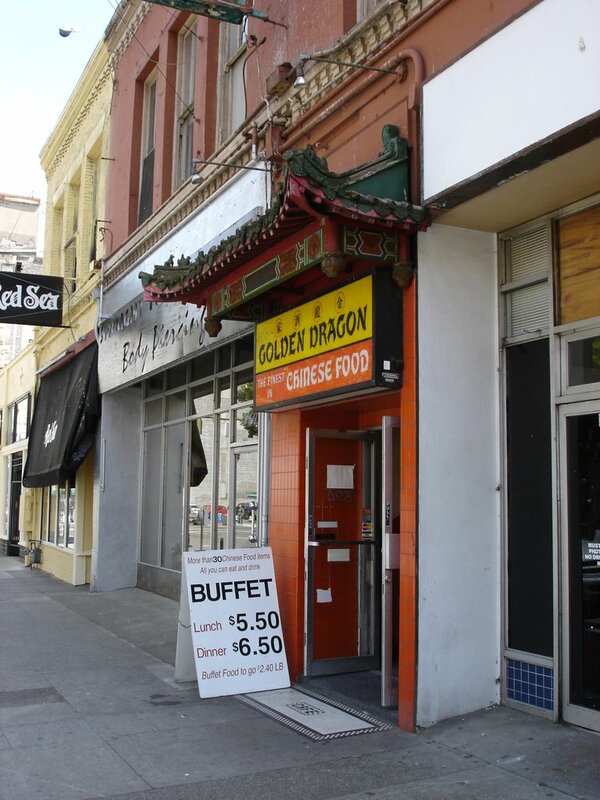 The Golden Dragon is located at 324 SW 3rd Avenue between Oak and Stark, above Cameron's Books. 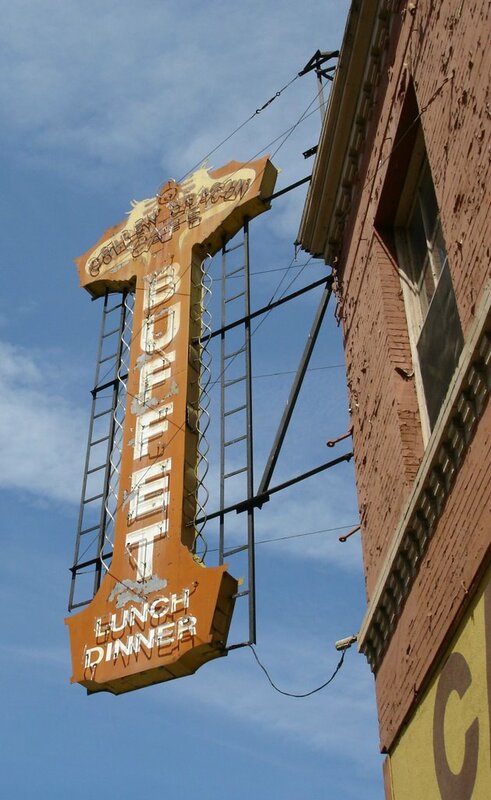 By the look of its sign, it might be assumed that it is the oldest Chinese Restaurant outside of Chinatown. That would be wrong. 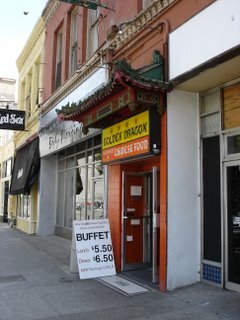 The Golden Dragon is very much a part of Chinatown. 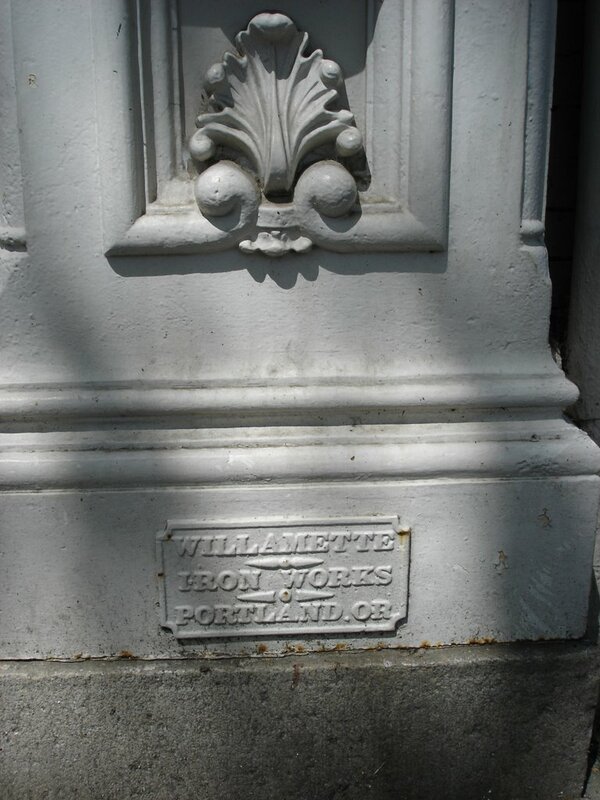 Chinese immigrants began to arrive in Portland in the early as the 1850s. In the book "Sweet Cakes, Long Journeys, the Chinatowns of Portland Oregon" by Marie Rose Wong, it is noted that the Oregonian ran and advertisment for the Tong Sung Restaurant & Boarding House on Second Street in December 1851. Mining and later railroad construction drew many (largely male) Chinese from the impoverished and war torn Guangdong provence in south east China. The welcome given to the "Celestials" as the immigrants were called was not always gracious. As their numbers increased, a segregated community grew up in the blocks behind the waterfront. At its height in the 1870's to 1890's, Chinatown ran roughly along 2nd between Front and 3rd (in some places as far as 5th), south to Mill and north, across Burnside to Flanders. By the 1920's Chinatown had split between the "old," south of Burnside centered on 2nd, and the "new" above Burnside in what was called the North End, centered on 4th. Property values were rising in the old Chinatown. As Chinese held leases expired they were not renewed. 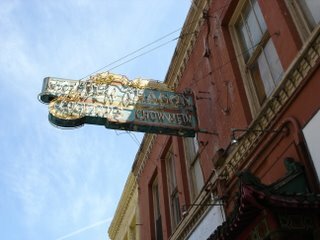 In 1932 the Oregonian wrote of the passing of the old Chinatown. By 1950 there were only four Chinese owned busineses south of Burnside. Could the Golden Dragon be the last vestige of Old Chinatown? The restaurant is reached by stairs from a street level entrance like the dearly departed Hung Far Low. The decor is eclectic. Red and gold painted Chinese woodwork with white walls under dim florescent lighting. Plastic flowers border along a row of booths. A giant gumball machine is near the cash register. A picture of puppies, a picture of kittens, a picture of a old sailing warship. Pictures of flowers, pictures of sunsets, pictures of beaches. Two clocks on the wall that look like they came from a 1940's detective movie. There is a bar which may, or may not be still in use. The food however is impressive. A vast and ample buffet. Mar Far, Kung Pao and General Tso all make their expected appearances along with egg foo young, various vegetables and chow meins. Less expected entrees are offered as well, such as that Soong Dynasty favorite, the pot sticker, mushrooms in oyster sauce and steamed fish. I really liked the crab and cheese puffs. There was a sweet and sour cabbage, that was sort of like sour kraut, but not. A "fritter" which was a kind of sugar donut without a hole. There was even macaroni salad. For the timid there are labels. Later in the week, a second visit revealed a thriving weeday lunch crowd. I asked the woman at the cash register how long the Golden Dragon had been there. "Over sixty years." she replied with a smile. Eventually I did make it to the Oregon Historical Society. Upstairs in the library I found a 1945 City Directory and looked up the Golden Dragon Cafe. 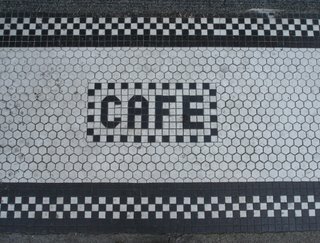 Sure enough, it was there in the same place (back to 1942). An earlier location however can be traced to 1935, two blocks south at 227 SW Alder with a Lee Wing listed as proprietor. Not just over 60 years but 71. The Golden Dragon chronologically contiguous with the last years of Old Chinatown, indeed it could be its final remnant. And the food is good too. The Oriental Gardens, a Chinese restaurant circa the late 1930's in the old Chinatown at SW 2nd and Pine, one and a half blocks to the north east of the Golden Dragon. The picture appears in Portland Vingnettes by Paul Keller and Sam Raddon Jr. Metropolitan Press, 1935-1940. 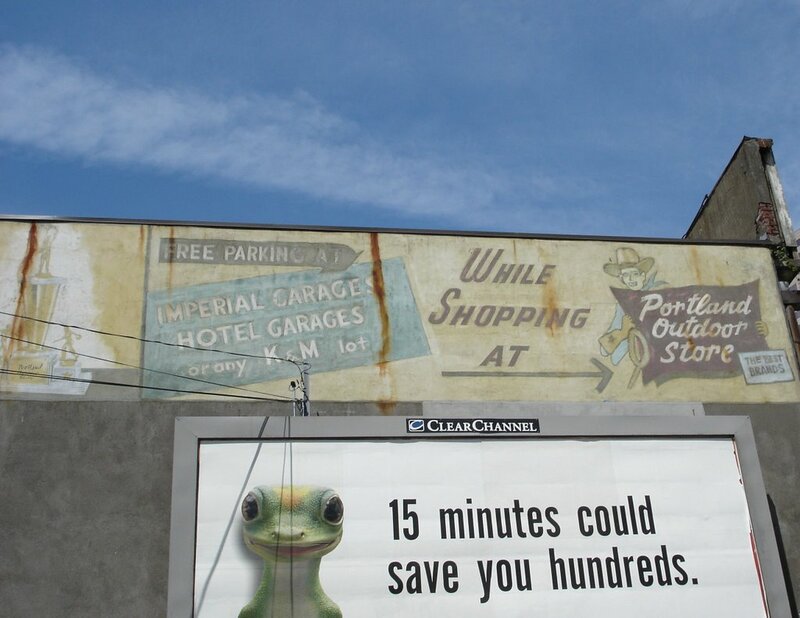 A history of billboard advertising, behind the Portland Outdoor Store.